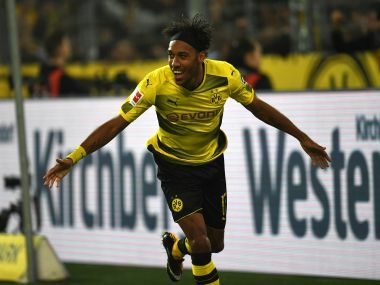 Berlin: Pierre-Emerick Aubameyang grabbed a hat-trick as Borussia Dortmund romped to a 6-1 home thrashing of Borussia Moenchengladbach to regain top spot in the Bundesliga on Saturday. Gladbach had no answer to Peter Bosz's fleet-footed Dortmund, who opened a two-point lead over Hoffenheim at the top in a perfect confidence boost before Tuesday's Champions League clash with holders Real Madrid. Aubameyang, last season's top scorer in Germany's top flight, has now netted eight goals in six league games -- one ahead of main rival Robert Lewandowski of Bayern Munich. Left winger Maximilian Philipp scored Dortmund's first two goals before Aubameyang's hat-trick, with defensive midfielder Julian Weigl scoring a superb sixth. "We were very dominant. 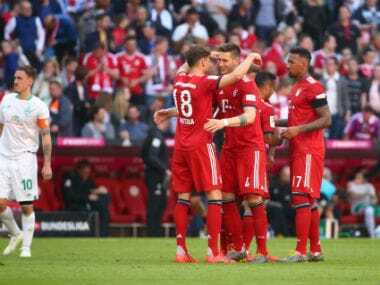 It was an intense game and we can be very satisfied," said Philipp, who also scored two goals against Cologne last weekend. Weigl was delighted to score on only his second game back from injury. "It feels great, the goal was the icing on the cake," said the Germany midfielder. "We were lucky that Gladbach did not use their chances and usually they have the quality to fix problems." After third-placed Bayern threw away a two-goal lead on Friday in a 2-2 draw at home to Wolfsburg, Dortmund are now three points ahead of the defending champions. Bayern could finish the weekend in fourth if Hanover 96 beat bottom side Cologne on Sunday. Hosts Dortmund needed just 28 minutes to take the lead at Signal Iduna Park when Aubameyang, who hit the post twice in the first half, played provider. A superb pass from Weigl released Aubameyang, who sprinted into the box and squared for Philipp to drill home and then grab a second ten minutes later thanks to Dortmund pressing. After briefly losing possession, Dortmund defended high up, forcing Gladbach defender Matthias Ginter into a mistake. Germany Under-21 international Jeremy Toljan left-back pounced on the loose ball and fired in a short cross for Philipp to score. Greece defender Sokratis rolled the ball behind the defence and Philipp squared for Aubameyang to make it 3-0 at the break. The Gabon striker grabbed his second when he hit the post on 49 minutes, but hammered home the rebound and completed his hat-trick by using his devastating pace on 63 minutes. Gladach's Lars Stindl became the first player to score against Dortmund in the league this season when he netted three minutes later. But Germany midfielder Weigl chipped into the top right-hand corner in the 79th minute from outside the area for a superb sixth. Teenage midfielder Dennis Geiger scored his first league goal as Hoffenheim briefly went top earlier in the day with a 2-0 win against Schalke. Geiger hit the top corner from the edge of the box with 13 minutes gone and Lukas Rupp added Hoffenheim's second just before the final whistle. Germany striker Timo Werner hit form with a goal and an assist during RB Leipzig's 2-1 win over Eintracht Frankfurt at the Red Bull Arena. 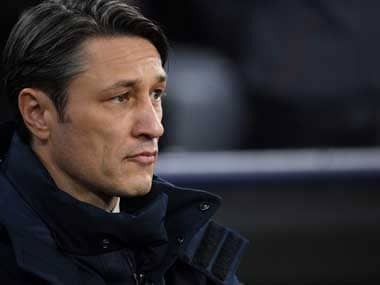 Leipzig responded to their shock 1-0 defeat by Augsburg, when Werner was below-par, and boosted confidence for Tuesday's Champions League match at Besiktas with an impressive display. Werner played a big part in the opening goal when his shot was saved by Frankfurt goalkeeper Lukas Hradecky, but French forward Jean-Kevin Augustin tapped home the rebound on 28 minutes. The 21-year-old Werner doubled the lead midway through the second half when he fired in off the post for his fifth goal in six league games to leave Leipzig in sixth. Hosts Werder Bremen and Freiburg both stayed in the relegation places after their 0-0 draw, while Augsburg are fourth after their goalless stalemate at Stuttgart. Striker Pablo de Blasis converted a second-half penalty as Mainz picked up only their second win in six games with a 1-0 victory at home to midtable Hertha Berlin.